For someone who has resided all her life in the middle east, I really surprised myself when I actually wanted to investigate and try out something I always had an opinion about, having noticed this really interesting display of fresh salads with a tiny cup of Labneh at the Le Marche Market. What exactly did they mix in the bland Labneh to make it so tasty, I wondered. Although I have heard of Labneh nth number of times, but still have had a preconceived notion, that it is typically something that only the people of Levant like and it would not cater to the taste buds of us Indian folks. And how my little experiment proved me wrong !! Not only was my entire household licking every bit of the bowl from all angels but Ms Big-time-food-stuck-up-me was also relishing this super easy dip. I would love to share this very simple recipe with all of you, my guests. I dont think, anything, this delicious can be this simple but truth is, it really is. 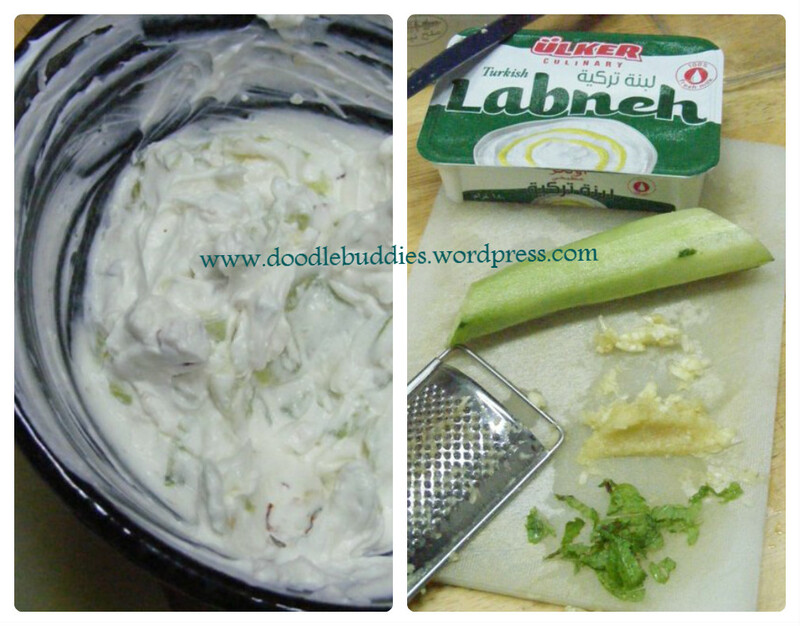 Mix the labneh and keep whisking it with a fork till it becomes dip consistency. Add the crushed garlic gradually lest, the taste becomes to sharp for you. slice the cucumber with or without their peel, into thin slices and add to the mixture. Chop a few sprigs of mint leaves and throw it in. My Indian taste buds yearn for some tinge of spice, and hence I have added 3 crushed red chillies. You can opt for just one. Salt to taste. Drizzle alittle olive oil over it. Ofcourse, our house was far too desperate so the olive oil was spared. Or it can be relished as a sauce with some khubz (arabic bread ) or pita bread. Or it can even adorn your party table with some cheese sticks or tortillas. With summer setting in soon in the west, this will make an excellent accompaniment with the barbecues too. What I really found amusing is how, I had to ward off tiny fingers, for just a couple minutes so as to click a few quick snaps !! Numerous ways to enjoy. Please share your experience here , if you have tried this lovely dip. Many regards and Bon Appetite ! !